Send me exclusive offers and promotions. View DisclaimerBy submitting your email address or phone number, you allow us, Plaza Auto Group, to include you on our contact lists to send you information about our products, services and promotions. You may revoke consent at any time by clicking on the "Unsubscribe" link in your email. 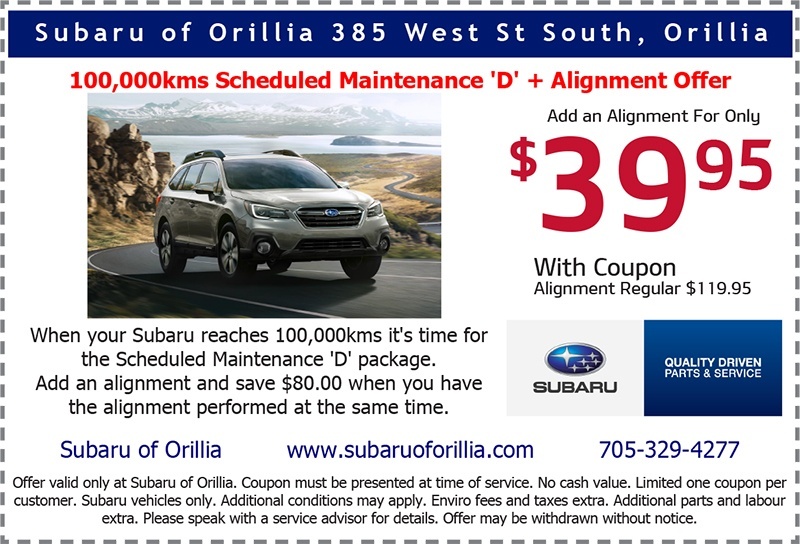 Disclaimer: Offer valid only at Subaru of Orillia. Coupon must be presented at time of service. No cash value. Limited one coupon per customer. Subaru vehicles only. Additional conditions may apply. Enviro fees and taxes extra. Additional parts and labour extra. Please speak with a service advisor for details. Offer may be withdrawn without notice.